Robi brings new SIM offer. Now you can purchase a new Robi Prepaid Connection at only 200 Tk.With every Robi prepaid connection, you can now enjoy 12 GB of attractive price internet! 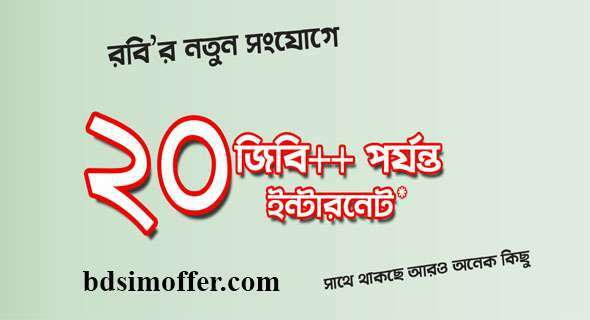 Robi New SIM offers 2017 1GB internet at 9 Tk. Free subscription for Robi Gongun, Robi Radio and Robi Screen service for 1 month. For the first time, you can buy 1 GB internet after recharging Easyload recharge of 9 Taka after 34 Easyload recharge. If you buy 1 GB internet pack at 9 taka, you must first recharge 34 taka. Recharge for the first time means that it has never been recharged before. Only applicable for new SIM customers. > Buy a standard Robi internet pack and get another 1 free for 3 months from the first recharge date. > Validities of the free internet packs will be equal to the validities of the original packs purchased (28 days). > Free internet pack usage time: 24 hours. > Free internet packs to be disbursed within 72 hours of pack purchase. > First installment of 100 Robi-Robi minutes will be given on first Tk. 9 recharge instantly. > Second installment of 100 Robi-Robi minutes will be given instantly on the 30th day of the first installment received date. > Third installment of 100 Robi-Robi minutes will be given instantly on 60th day of the first installment received date. > Robi-Robi bonus minutes are applicable for FnF or Priyo numbers. A handset will be eligible for an attractive offer of only one rechargeable (Tk. 34/9 / recharge) at the same time, even if there are multiple SIMs. For each new Robi Prepaid connection, subscriber can enjoy 12 GB of attractive price internet. Customers from another package can’t migrate to this package. However, migration can be done from this pack elsewhere. If the migration to other Robi packages, the customer can use his existing data pack (if any). The offer will be valid for a limited time. - Amongst the three offers, no two offers can be availed simultaneously for 3 months from the first recharge date. All of these three offers are mutually exclusive for the first 3 months from the first recharge date. - On availing the same offer within the running validity period, the new longer validity period will be activated for the rate-cutter only. - Migration-in to this new package is NOT allowed. - Migration-out from this new package is allowed. On migrating out to other Robi packages, the customer will NOT carry the rate-cutter offer, but will carry the respective talktime/internet bonuses (if any). However, uptake of the recharge offer in the new package will be ineffective. - After the respective validity period, the default call rate of 18 paisa/10 second will be applicable. - 3% Supplementary Duty (SD) + 15 % VAT on price inclusive of SD applicable for all the tariffs.